19 Festive ideas for making your home magical this Christmas! 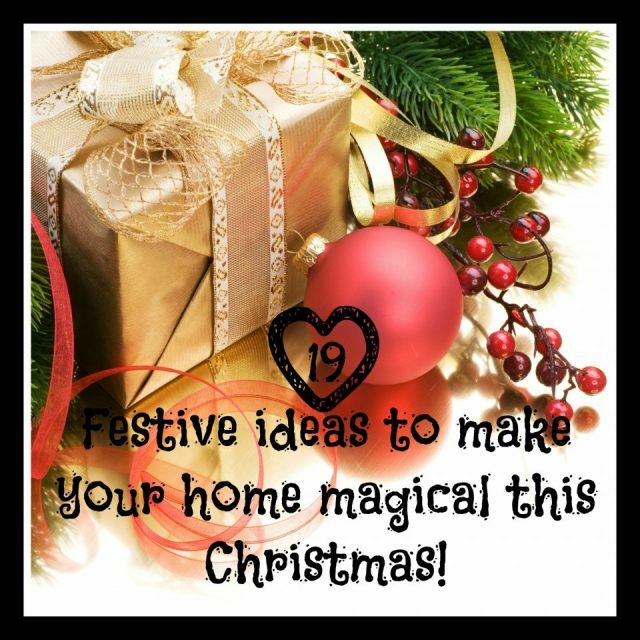 Home » Family Activities » 19 Festive ideas for making your home magical this Christmas! Here are some great Christmas decorating ideas to make this Christmas just that more special for your kids and family. 19 fun, fabulous and festive ideas for making your home magical this Christmas! Fill a small glass bowl or decorative Christmas bowl with small pine cones and display on end tables, shelves, buffet tables, etc. Spray the cones with fake snow or even sprinkled glitter. Decorate plain red, white, green or gold candles with stick on stars and use in your dinner table center piece. Add colour to a room with vases of red and white flowers or float the flowers in crystal or glass bowls and use as dinner table centrepieces. Wrap an assortment of medium to large sized boxes with Christmas wrap. Attach ribbons and/or bows. Stack the boxes in a corner from floor to ceiling. Create a display of teddy bears (or other soft toys) dressed for Christmas. Get three or more toys and arrange them on a table or on the floor in a corner. Dress them with scarves and mittens. Place candy canes in their hands or tie bows around their necks. You can even wrap some small, empty boxes with Christmas wrapping to put in their hands. Turn an old chest or even a suitcase into a Christmas chest. Place the suitcase on the floor against a wall and open the lid (prop the lid open if it’s likely to close by itself). Line the inside of the suitcase with fibre filling to create the illusion of snow. Drape strings of tinsel and white indoor Christmas lights around the suitcase lid. Fill the suitcase with wrapped presents or even wrapped empty boxes. Sprinkle a few gold-wrapped chocolate coins around and inside the suitcase. A nativity scene also works beautifully inside the suitcase. Cover a side table or a shelf with white paper. Arrange small pine tree twigs to cover the top. Place tall candles in candleholders in a group on the table top. Don’t light the candles until the kids have gone to bed. Before lighting the candles, be sure that the greenery is not close enough to catch fire. Hang mistletoe and holly over every doorway, especially the front door. Use false or fresh mistletoe. String a ribbon from one end of the wall to the other. Attach the ribbon to the wall (at each corner) with drawing pins. Clip Christmas cards to the ribbon with clothes pegs. If the ribbon is too long, the weight of the cards will pull it off the wall, so support it here and there with more drawing pins. Bake sugar or gingerbread biscuits. Before baking, make a hole toward the top of each biscuit with a straw. Bake and cool. Dust with icing sugar. String a ribbon through each biscuit and hang them on your Christmas tree. Hang a collection of Christmas stockings on your fireplace, or the front of a shelf or even an empty wall (even if you don’t stuff them). The more the better. If you don’t have real ones then make cut outs of stocking shapes from Christmas wrapping paper and stick to the shelf or wall. Arrange oranges, apples and gold nuts in a large bowl and tie a ribbon bow around the bowl. Display a large collection of photos from Christmases past. This makes a wonderful talking point. Use a collection of different picture frames or make a frame using coloured cardboard or craft foam. Instead of displaying each picture individually, you can create a collage. Decorate the frames with holly, tinsel or bows. Paint fruit such as apples and pears with egg white and roll in gold or silver glitter sparkles. Air dry on a rack overnight and display in a decorated basket along with nuts in their shells. Cut snowflakes or bell shapes from white paper and hang them in all of your windows. Decorate with silver or gold glitter sparkles. Use thick sewing cotton or even thin fishing nylon to string popcorn, dried cranberries, coloured macaroni, beads, etc. and hang the garland chains everywhere. Wrap indoor Christmas lights around a stair railing or banister. Tie securely with thin fishing nylon. Be careful to tape down the electrical cord so that no one trips over it. – Don’t use lights if there are kids in the house! Rather use strings of tinsel then. Make some old-fashioned tree decorations. Tie ribbon to small pine cones for hanging. String streamers made from popcorn. Make paper chains of small bell shapes covered in gold or silver glitter. Cut pictures out of old Christmas cards and create a collage by gluing them onto a piece of poster board. You can frame the poster board with tinsel and small bows. LOOK OUT FOR EVEN MORE IDEAS IN OUR NEXT ARTICLE!